I’ve always believed that ghosts haunted the University of Alberta campus. Last week, I found out I was right. Last week, I went with some friends to take in the UofA ghost walk. We gathered in front of the Rutherford House on Saskatchewan Drive—a surprising forty people for a cool night in late October. Our guide stood on the steps of the house and outlined our walk. She told us about the house itself, Alexander Cameron Rutherford and his family who moved into the house in 1911. She encouraged us to visit the house, where, if you listen carefully, you can hear the ghost of a little boy and his ball who has haunted the second floor of the Rutherford House since the 1980s. Our walk took us across campus to the Power Plant, where we learned about Dr. Carl Clarke, an early researcher into the oil sands, whose lab-coated ghost still wanders the building. We headed next to Pembina Hall on the west side of campus, where we learned about the 1918 Spanish flu epidemic in Edmonton, and the bodies that were temporarily piled in the basement of the building. Finally, we walked all the way BAC across campus to the Emily Murphy House, where our guide told us about Emily Murphy, the Famous Five, and the early days of Alberta politics. People say you can sometimes still see the ghost of Emily Murphy, and sometimes, you can hear the kettle whistling in the room that was once the kitchen. There was much more to our walk, as it was a historical tour as well as ghost walk, and our guide had many stories about the early days of the UofA. You can find more stories about campus ghosts here. I wouldn’t say I’m overly sensitive to ghosts. I’ve been inside Glamis Castle in Scotland, which is supposed to be one of the most haunted castles in the country, and I didn’t feel too bothered. One gets a sense of days long passed in such a place, but I never felt or heard anything specific. As you travel through Scotland, it’s hard not to encounter literary types from the past. This last May, my daughter and I drove from Glasgow down to Dumfries. We wanted to see the Robbie Burns House. In spite of teaching English for a living—not to mention my Scottish heritage—I found I knew surprisingly little about Burns. I knew he was a poet, of course, but I didn’t realize he died so young—at the age of thirty-seven. We found the house, a small two-story place just off a busy road in Dumfries. It had a large room downstairs, with a wide fireplace and alcove for possibly preparing food. Upstairs had two rooms, one with a small space, big enough to hold a desk where Burns wrote and worked. The man clearly loved women, as he had several illegitimate children, as well as a family with Jean Armour. The last few years of his life was spent working as an Excise Officer in Dumfries to support his family. Not quite the romantic picture of the Plowman Poet—save for maybe the illegitimate children. You can read more about his life here. We walked up the street to the church where Burns is buried. It’s a mausoleum, a structure about the size of a garden shed, where Burns and Jean Armour are buried. Apparently, William Wordsworth and his sister Dorothy visited Burns grave, which at that time was a simple stone, not befitting the romantic life and legacy of Burns. The mausoleum came later. After leaving Dumfries, we looked for a place to picnic. We found a lovely spot in the Forest of Ae, a grassy spot beneath a tree, right next to a burn. We sat, had our lunch, listened to the cows across the road, and watched the dog-walkers and cyclists pass by. We drove north the next day towards Inverness, passing through lovely countryside, open and hilly, with heather and gorse purpling the fields—the perfect place for romantically minded, heartbroken young men to wander in despair as they thought of their lost loves. We made one longer stop on the way north—a place called The Hermitage, which is a park in Craigvinean Forest. The walk takes you through tall trees and down to the River Braan, a shallow, fast-flowing stream. Again, Wordsworth and Dorothy got there before us. As we wandered along the path, I thought about what it meant for me to walk such a path in the footsteps of people like Wordsworth and Dorothy, who saw these same sights nearly two hundred years before. For the last five years, I’ve been trying to arrange a trip to the UK. I finally managed it, and now I’m here. The last time I tried to travel to Britain, I had to cancel because of family matters. That was for a Harry Potter conference in Scotland. Much of the travelling I’ve done recently is like that—taking trips to places, but always to a conference. Travelling to conferences means that you need to attend sessions, and you get less of a chance to see the place you’re visiting. This time it’s different. I’m travelling with my daughter, and we are hitting as many interesting sites as we can. Because so much of my reading and academic work is tied to this island, my trip feels as much a literary pilgrimage as it does a holiday. We’ve already seen many places in and around Glasgow, but so far my favourite has been visiting the antonine Wall near Falkirk. 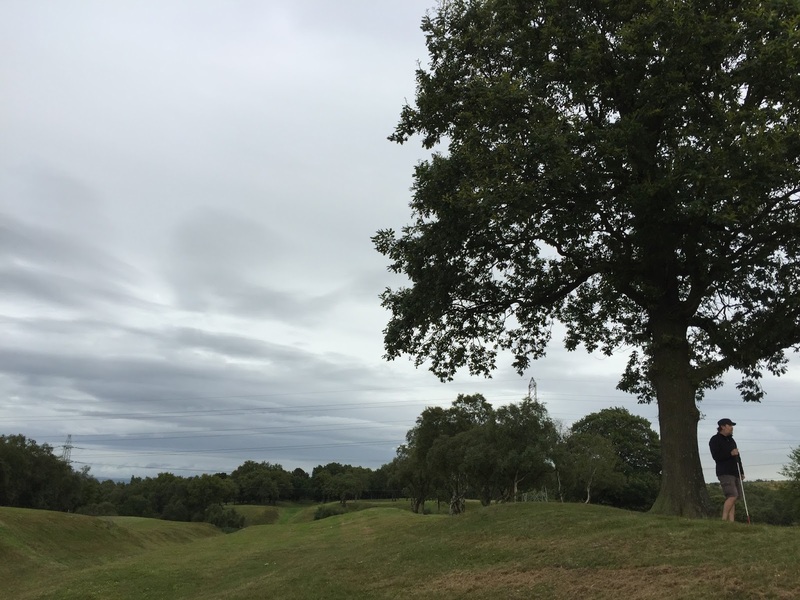 The Antonine Wall is a roman Wall built around 142 C.E., which was a way for the romans to try to push their territory into what they called Caledonia. 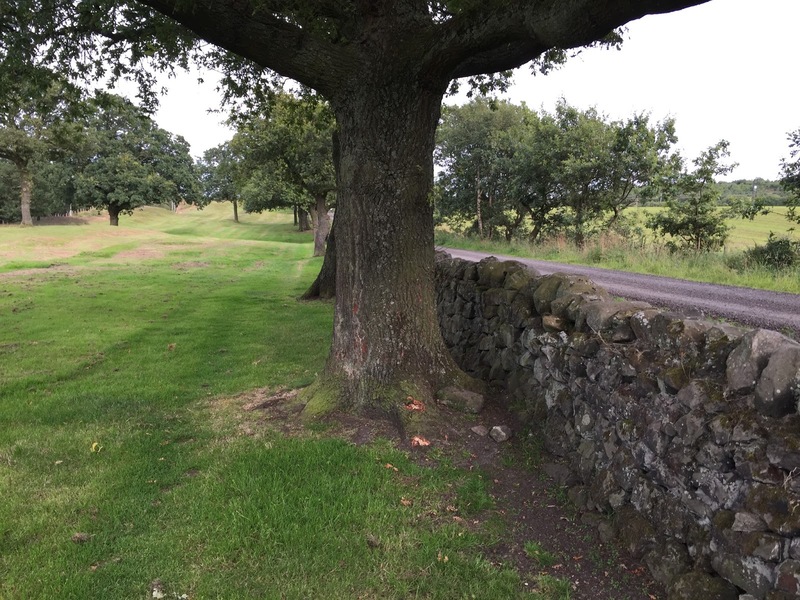 Unlike Hadrian’s Wall, a hundred miles to the south, the Antonine Wall was a turf wall built on a stone foundation. The foundation remains, but little else. You can also find the remains of a roman fort known as rough castle nearby. The romans abandoned the wall after only eight years, withdrawing south to Hadrian’s Wall. We got spectacularly lost trying to find the wall—missing a sign, and getting sent in circles by the ubiquitous round-abouts, which seem to be the favoured way of moving traffic here. Once we found the site of Rough Castle and the Antonine Wall, we got out of the car and began to wander. There’s a dog park on the other side of the wall, and people were out walking dogs or jogging in the late afternoon. There I was, my hands on the wall—an ancient foundation, now covered with moss and grasses, built nearly two millennia ago by the romans. We walked farther on to the site of the fort, and I stood on the remains of the rampart, and thought about the romans and their efforts to push their way into this country. Who knows what the peoples of northern Britain thought of these southern invaders. We of course can speculate, and I could feel my imagination running away with the possibilities. I thought of Tolkien as we followed a path lined with large stones leading to the fort, , and standing on the old rampart I thought of the books I’ve read by rosemary Sutcliff—books such as The Eagle of the Ninth, in which Marcus and Esca, his friend and former body slave, journey into the north to discover the fate of the lost Ninth Legion. The hills, the quiet, and the ancient stones covered in grasses fill me with an emotion I can’t articulate. The place itself inspires the imagination, but I also feel a connection to the landscape and its people through the books I’ve read that were in turn inspired by these same places and their histories.